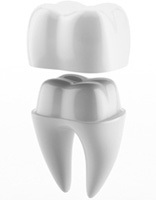 A tooth that’s been damaged, cracked or simply worn down needs a reinforcement to protect its remaining structure. Beaufort Street Dental Centre offers crowns that are placed over the damaged tooth to protect it. Crowns can also be placed over a dental implant by our team, giving you the full function and structure of a missing tooth. Contact us today to find out if this solution will work for you! Use your insurance and have your claim processed immediately with our HICAPS machine. Call (08) 9272 1956.